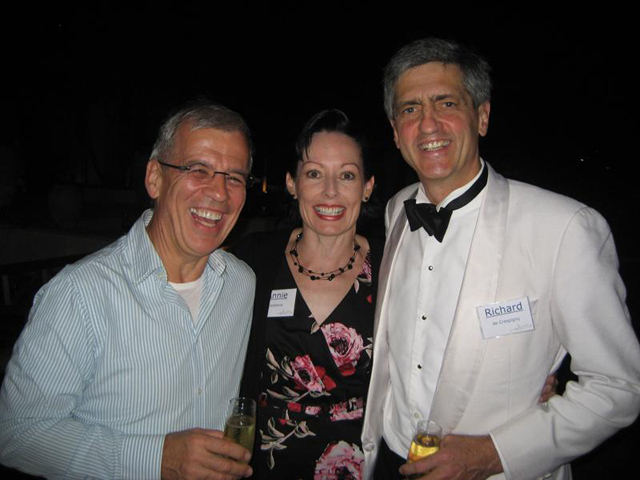 Hi Richard, It’s been quite a few tears since we flew together on the B747-400!! In fact I had flown with three of you out of the four on the flight deck on the eventful occasion which made reading your book all the more interesting. Sadly I missed your talk at my local library. So congratulations on your AM yesterday; you must be feeling pretty chuffed (and rightly so!). Rgds Tony. You are a deserving member of the Order of Australia today January 26, 2016. Congratulations and thanks, most of all, for telling your story for the benefit of all those who fly and have the responsibility of getting us all to our destinations safely. It is likely that you have done more for Qantas than Tom Cruise and Dustin Hoffman! But it is certain you have done more, still, by showing us all you can dust yourself off , and get back to work. This is a great inspiration for me at the moment,so many thanks. 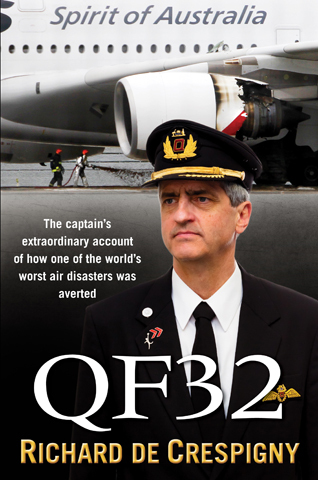 Thank you very much for writing QF32 which I read in a day. Your story is heroic: you are a legend in my mind. It shows how, when the world is crashing down, that a person can regroup and function for a successful outcome. To focus on what is going right is a valuable lesson. I flew in 707s for Qantas in 1966 (as a Flight Hostess) so the context of your experience took me back to those days. Vygotsky’s “Zone of Proximal Development” (ZPD) basically means: the ability to function outside the information given. I relate it to courses where behaviorist learning doesn’t equip a person to handle ‘text book’ situations. I thought that, as you explored and applied options, you were forced to function within this zone as your experience was outside a simulated training environment. Did you fail the examiner’s test because you functioned outside the textbook? Did he not take into account that all passengers and crew safely left the aircraft, which is surely the a goal of any flight? I chuckled when I thought about what was served during “a supersonic buffet” (QF32 p. 101). trained and experienced crew using exceptional CRM principles and a strong capable airplane show what can be achieved. I too join with the numerous other respondents here in asking about the circumstances surrounding the route check ‘fail’. I can’t find any direct answer although you say numerous times there will be an explanation. Have I missed this somewhere? Of course you final words in the book are no doubt intended to provoke just this question! I’m left with the only logical assumption, being that the full sector was not completed as may be a requirement and the fact that you got your crippled bird back to earth could not substitute for a pass. Nonetheless, I’d love to see your version! All the best for many more years of safe aviating with no more engine failures! I just read your book from cover to cover today even though I haven’t had enough sleep in the last 2 days – it is an inspiring account of a great achievement. Thank you. I am a surgeon, and our profession is being told how much we need to learn from pilots about how to deal with crises and safety issues. Until I read you book, I must say I was not inclined to agree with this, but now I realise how much the discipline and training, not to mention the individual qualities, go to make up a professional aviator at your level. I feel humbled. Thanks for such a great book. I loved it. Thank you for your candid thoughts. Pilots and doctors share the same passion for excellence and perfection and the safe ones appreciate that we never attain this target. There is always more ways to improve. I’d feel safe “under your knife” anytime!. 1) Why is doing a ‘control check’ such a dirty word in aviation. I have no training whatsoever. I’m talking about when reading about the discrepancies between what the computer was telling you and what you believed to be the case regarding possible flight parameters. The first thing I thought of was, “why not just test what is real – within limits of course – while at 7000 feet rather than finding out when too late?” I was glad you did this but astounded to learn it is uncommon. Why is this? 2) Why did you fail your test as stated at the end? I know you’ve already been asked but fear I may have missed the answer. Firstly I want to thank Richard for writing the book, it really was an amazing book to read. I’m just about to commence my final year of aerospace avionics engineering at QUT Brisbane, but still have desires to become a pilot one day. I’ve always been fascinated with aviation and wanted to be a fighter pilot myself in the RAAF, but due to height and medical reasons I don’t believe I would have been able to. This book as reinvigorated my desire to become a pilot, and I’m looking forward to the release of Big Jets hoping it will aid in my learning. I’m not much help for your first question, Michael, but I know the answer to your second question. I’m not sure if Richard has said it somewhere on this website in writing, but I found out from one of the radio interviews he did with Rod Quinn. He said that the statement “I didn’t pass” was a little bit of tongue in cheek. He didn’t pass the route check, but neither did he fail as the ‘checking’ ceased to be conducted when they realised how drastic the situation was and the checkers starting assisting in getting the plane home safely. Thanks Rich, yes, I was on Qantas – it was QF127 yesterday and returning QF128 next Sunday. That would have been awesome if I’d been reading the book when you were the pilot, but missed by one day! My late father was with Qantas for over 35 years so QF is always my first choice. As to my question, it was more about the ‘why’ of not passing. I’m sure from reading the book that you can understand the curiosity of a ‘why’ question rather than ‘what’ – you know, the stuff that can’t be Googled. Love your avatar of Scott Tracy and Brains – maybe you switch between the two personas as pilot and computer nerd, LOL. Cheers, Pam. Just read the book cover to cover while on the A380 Sydney to Hong Kong with a couple of hours to spare. Fantastic job – the flying and the book! I just wish there had been a bit more at the end (you left us up in the air, ha ha!). Why didn’t you pass the route check? Are you back flying now? More detail please??? Dear Pamela, I am back flying and very happy. Great book, I really appreciated the honesty and your background info. I have a Private Pilot Licence and am an aircraft owner (twin Comanche). Your book has made me think more about my professionalism when flying. I have been looking forward to reading your book for Christmas (I would have bought it earlier, but it was a present from the kids) and I have enjoyed every minute. I tip my hat to your professionalism and great human nature in the way you took your responsibilities to heart in such unimaginable stressful situation and never gave up. It is also great to hear that after such an incident that you are back in a good place mentally and QANTAS was there to assist you. I have just booked a trip to the USA from Brisbane next year and I rearranged the flight deliberately just to fly in an A380 (short-cut via Sydney). Your description of the aircraft and its trials and tribulations have not dampened my enthusiasm but have strengthened my belief that it is a fantastic aircraft. Colin we share a fascination and passion for everything that is wonderful about the A380. I hope I will be flying you on your future trips. Best Regards, Rich. Greetings and best wishes Richard. My wife gave me your book for Christmas. I read the whole book without a break on boxing day. It’s always been my belief that a pilot is worth every dollar when faced with a situation like you faced, pushing the nose down right at the point of touchdown, and using ground effect to slow the rate of descent was inspired. Do you still ride dirt bikes? Hi Adam. Please apologise to you wife from me for your Boxing Day being 100% distracted! I don’t ride dirt bike at the moment. I have been cautious about undertaking activities that might hurt me and invalidate my aviation medical status, but with the children now out of home, I can perhaps take more risks and return to the dirt tracks. That would be fun! Your book was fantastic and I just could not put it down. I have a quick question about future aircraft plans. I have already learnt about Boeing’s plans with the yellowstone project but Airbus’s plans aren’t as clear. Would you mind explaining what you know about this subject and how Qantas will react to these changes. Wonderful book. I read it in a day-couldn’t put it down! A mate of mine flys Airbus & Boeing for Etihad so when we meet I can talk the jargon I learnt from the book….at least I’ll try! Thanks Cap! The book was a joy to read and i learned a lot from it. OMG!! The most dramatic aviation heroism account I’ve read. Surpasses the storyline in Unbroken for drama. I can’t believe that you did not pass your accreditation during this flight!